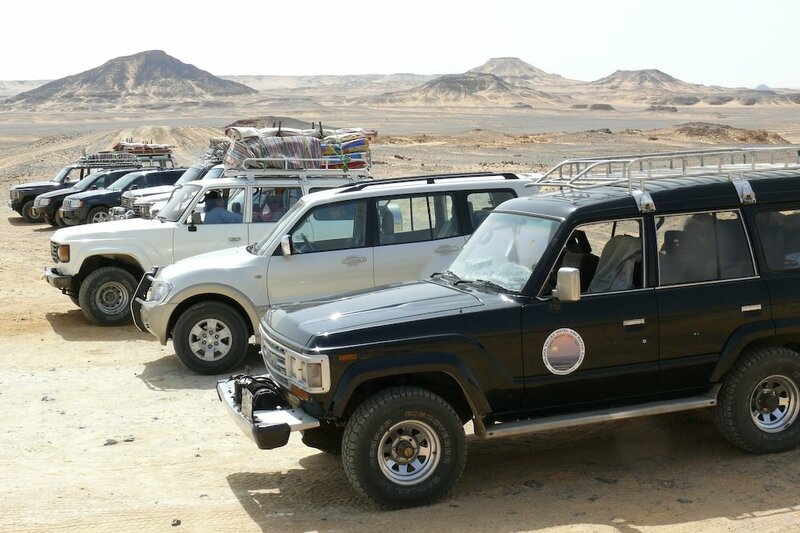 After arriving in Bawiti in the Bahariya Oasis in time for lunch at Golden Valley Hotel, transport to Crystal Mountain to start the walk of the first day. The first days walk into the desert is ca 5 km and by sunset we set up camp and enjoy the first evening of barbecue and music around the camp fire. After breakfast we walk to El Agabat through the desert while our camp is packed into the cars and taken to our next camp. Lunch will be served on the way to El Agabat. When you arrive at El Agabat the second camp is awaiting you for another night under the stars. Todays lunch will be served at Magic Spring. After a well deserved rest the walk continues to the sand dunes (Craween Sand Dunes) were the third night camp will be. This mornings walk takes us to the valley Abu Hawas were lunch will be served. After lunch the walk continues to White Desert for a last night under the stars. After breakfast we walk to Ein Wadi and then continue to the trees at Ein Santa were our cars will wait to take us back to the Bahariya Oasis.